Simon Hansen has been working in the Film and entertainment industry since 1992. He is best known for producing Alive in Joburg, the film on which District 9 is based. Hansen discovered and mentored long-time collaborators and friends Sharlto Copleyand Neill Blomkamp. Hansen mentored many animators and film makers in the South African and African Film Industry. Hansen was partnered with Copley in business for well over a decade. They supplied ETV with a show called Deadtime which ran during the ‘dead time’ of midnight to 6am. As a writer, producer and director, he has worked to build a film industry in South Africa that can compete in the international arena. Hansen owns a Visual Effects company called Inspired Minority VFX and a production companycalled Inspired Minority Pictures, which is now his vehicle for creating, what he calls, ‘commercial Independent’ films. In 2005 Simon and Sharlto produced a short film directed by Neill Blomkamp entitled Alive in Joburg. The film features a documentary style account of aliens living in South African townships and is the basis for the 2009 summer movie District 9 which starred Copley. Hansen also directed some second unit in District 9. Currently Simon is the executive VFX producer at Inspired Minority, ensuring work is delivered at the quality and schedule the client expects. 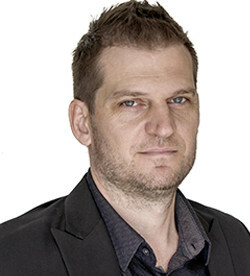 Wicus Labuschagne started his VFX supervising and VFX producing career on the South African feature film “Die Windpomp (2014).” Wicus joined Inspired Minority primarily post-producing and supervising VFX work and training and mentoring new talent. Wicus was recently nominated for a Visual Effects Society award for his work on Roots (2016). At IMP Wicus is responsible for managing jobs, bidding work to final delivery, staying on budget, client relation and hiring talent. Paul Kalil is a VFX supervisor and producer at Inspired Minority Pictures, with 12 years set experience in the South African film industry. He is well suited to IMP’s vision of utilizing creative and involved VFX supervisors empowered to make executive decisions on the day to increase production value. He was producer on the VES award nominated “Roots Night One”, as well as Gavin Hood’s Eye in the Sky. He produced and supervised the 4 part ITV miniseries, Tutankhamun, and supervised the recent sequels in the Tremors and Bring it On franchise for NBC Universal. Paul comes from a background of on-set practical motion graphics and design. He works closely with the team at IMP to develop time and money saving workflows and unique approaches to visual effects. Jonathan Alenskas is a VFX supervisor at Inspired Minority Pictures with seventeen years professional experience as a 3D and Compositing Artist, VFX and Digital Supervisor. Jonathan excels at communicating a project’s vision, creating beautiful imagery and delivering on time and within budget.